Mastered on Mobile Fidelity's world-renowned mastering system, this hybrid SACD presents the famed duo's landmark third record in superlative sound. Reflecting the perfectionist-minded nature of Bob Johnston's meticulous production and the group's painstaking arrangements, Mobile Fidelity's reissue brings to light textures, nuances, details, and microdynamics obscured on prior editions. The hyper-realistic results give you a seat at the recording studio. 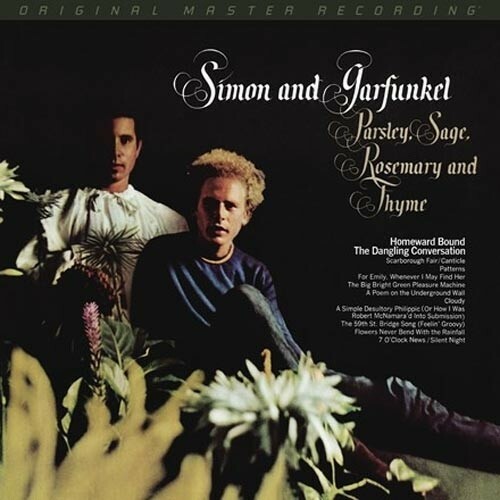 The first Simon and Garfunkel set captured on an eight-track recorder, Parsley, Sage, Rosemary and Thyme here bursts with colors crucial to the scope of the songs. Separation between vocals and guitars, images of individual players, and the dimensions of the wide-spanning soundstages all flourish. Harmonies crest and seemingly float on bypassing clouds. Acoustic passages blossom with lifelike structure and tone. The intent of deliberate euphonic variations – like those between the pair's singing and Charlie O'Donnell's spoken news report on the closing "7 O'Clock News/Silent Night," which function as both poetic and social commentary – is made clearer by way of the SACD's reference-caliber transparency.